Anyone here make your own? If so, what is your method, grind size, and steep time. Also, do you use any special equipment or just a pitcher? It is the only coffee I drink at home. Much less acidic. I bought a burr grinder and grind fresh medium or dark roast beans at the roughest setting (looks like big chunks) and brew for 24 hours. The pitcher lasts me 3 days. It is concentrated, so I mix it with unsweetened vanilla almond milk. I have found that it does better with minimal air (almost a vacuum). I fill it up all the way, running the water through the grounds, then seal the lid. I like hot a.m. coffee from my press but if I was doing cold brew it would be with a blender and whole beans with spring water. I've never actually had cold brew coffee but only drink iced coffee. 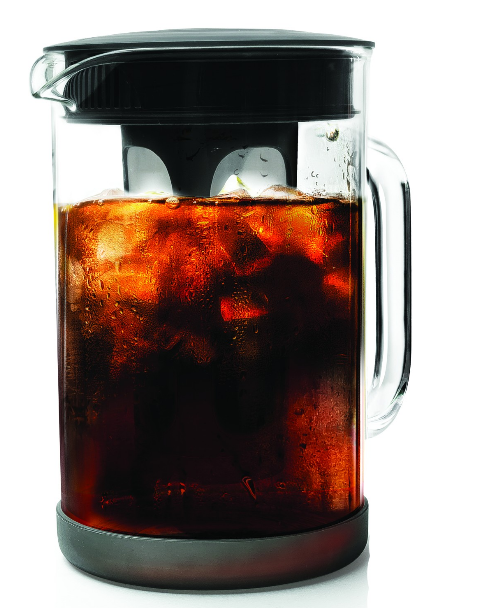 What is the benefit of cold brew? I've seen a couple places advertise it. Yes. It’s all I drink at home. I’ve got a fancy “showpiece” system and an old $20 Toddy system that I’ve been using for over 40 years. Toddy is easier and better. I make coffee concentrate and freeze it in pints. Lasts forever and easy for travel plus works as refrigerant for cooler. Usual mix is 1 jigger of concentrate per cup but can go stronger to taste. Everyone loves it. I’ve tried other coffees but always go back to Community Dark Roast. Order that in the 1pound size from Community. The smaller sizes they sell at groceries in Florida don’t work right. I get just over 3 pints of concentrate from a pound of coffee. Toddy Cold Brew. Cheap and easy, and makes a perfect batch of cold brewed coffee. Wife and daughter love it. Grind your own beans so that you can make them course. Light, medium, dark roast- all up to you and your preference. Depending on the bean used, it can be 70% less acidic than hot brewed coffee. I had some gut issues after Afghanistan and was just experimenting with my diet. It also has more caffeine, so 1 cup is all I need in the morning. I still drink hot coffee sometimes, just not in the morning. Never thought I’d give it up. I use this one. I haven't used it in a while because I'm lazy, but when I do I love it. Cold brew is waayyy better. Much less acidic. I can't stand black coffee, but I could drink cold brew straight without any sugar or creamer or anything. 1) That stuff is ROCKET FUEL. You think regular coffee has caffeine? LOL. I literally get a buzz from D&D cold brew. Starbucks is even stronger. 2) It supposedly makes the coffee less acidic and smoother tasting. I've noticed this with both D&D and Starbucks. My homemade stuff always comes out pretty stiff lol. 3) It saves money. You use less grounds to make it because its a slower but more efficient process. The idea is it makes a concentrate that you mix with an amount of water. I drink the stuff straight. I'm a coffee addict. Btw if you guys haven't tried nitro cold brew yet, please do. Only a couple places carry it. Starbucks has it in certain locations. It's like drinking a nice stout. I just add a couple of cups of already ground Folgers to 2 quart container, let it sit for 24 hours, pour through coffee filters to get the grounds out and it is fantastic ! No acidity and it will keep just fine in the fridge for a couple of weeks.